Feel free to e-mail us with any questions that are not answered below. &plus; How can I justify the FM BENCHMARKING expenditure to my management? Most people recoup the small expense of FM BENCHMARKING within just a few months of implementing the best practices that you’ll identify through this process. Try our savings calculator to see what you can expect. Visit the individual product pages (Premium, Starter, and Query) for pricing info. &plus; When does my annual subscription term start and end? Subscriptions for all of our products run for 365 days. For the Starter and Premium Editions, you earn your “survey credit” immediately upon purchase but your subscription will not begin until you assign it to a building (you will have 1 year to assign it and then 1 year to use it). Once assigned, you may input or modify data any time. For Query, your term begins when you pay for your credits. &plus; How difficult is it to upgrade from the Starter Edition to the Premium Edition? It’s easy. Simply contact us to request an upgrade and we’ll migrate all of your data to the Premium Edition. &plus; How often can I run reports? You have unlimited use of the Starter and Premium Editions as long as your subscription remains current. For Query, you can run up to 25 different reports at any time during your annual subscription period; once you run a report, you may access it as many times as you wish for 30 days. You also may purchase additional bundles of 25 reports. Note that only the Starter and Premium Editions require data input. &plus; How long will it take to input my data? That depends on you. Both the Starter and Premium Editions require minimal data. If your data are available in your organization’s financial or FM systems, you probably can input most of what you need in 1 hour or less, plus an additional 30 minutes for best practices data. If you want to use the Premium Edition for in-depth, comprehensive benchmarking to maximize your savings, you can spend as much as 2 days inputting data; however, this is usually unnecessary — instead, we recommend that you focus on the areas of most concern, which will reduce your data input time to about 4 hours. If you are inputting data for multiple buildings, it may be easier to use our spreadsheet template. Ask us for more information about this option. &plus; Do I have to collect and input all of my data at once? How can I streamline the data input process? No. To begin the benchmarking process, you only need to input data for a handful for core parameters, although we recommend that you also complete the best practices modules (so you can see how to improve your results). You can always return and add data at any time during your subscription period. In addition, you can selectively input data for areas you’d like to benchmark initially. If you are primarily interested in summary data for each FM area, the Starter Edition likely will be the best solution for you. &plus; How do I know when it’s time to upgrade from the Starter Edition to the Premium Edition? Before you can upgrade, you’ll need at least 2 years of benchmarking data. One reason to upgrade is to investigate areas where your buildings are underperforming in more depth. For example, if your overall maintenance costs are high, you can use Premium to pinpoint identify specific maintenance crafts that are driving these costs. 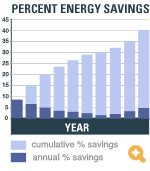 Another reason is to take advantage of Premium’s enhanced reporting tools, which allow you to compare costs among your buildings (for example, to see if your electrical repairs are much higher for one building than others) and see performance trends over time. Keep in mind that the Premium Edition requires a minimum of 50 buildings. &plus; What if my data change during the year? Can I rerun the reports? Yes; you may update your data and run reports as often as you want during your annual subscription period. &plus; I’m not sure I have enough data. Does that mean that FM BENCHMARKING is not for me? Many participants don’t have all their data when they begin benchmarking. Fortunately, you don’t need much to get started, and nobody needs to input data for every field; in fact, different types of organizations and buildings will benefit from different metrics. Once you run the tool, you’ll be able to determine whether to refine your results by inputting additional data. &plus; Do I have to input data for all of my buildings? No, you may input data for just a single building. 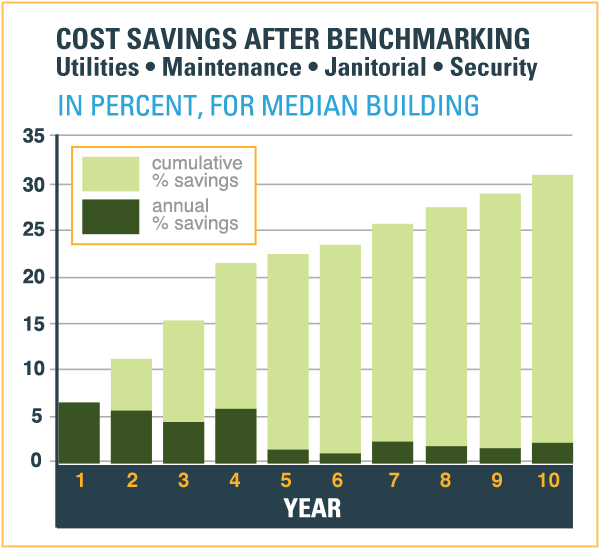 However, benchmarking multiple buildings will give you additional insight about their performance. Note that we offer a special report that shows each of your buildings for easy comparison. &plus; My data is already in spreadsheets. Can I upload them directly into FM BENCHMARKING? Yes. We offer a spreadsheet template so you can migrate your data into FM BENCHMARKING. Contact us for details. A fee may apply. &plus; What if I have a campus setting? Can I put all my buildings in as one? It’s up to you. If you have separate metering or if you track costs for individual buildings, we recommend inputting the data for each separately to obtain the most meaningful results. But if you cannot do this, you can aggregate your data. FM BENCHMARKING allows you to specify a campus setting so you can compare your results to others who also have a campus setting. &plus; Will my company name be confidential? Yes! We never associate your name with others outside of your organization, and your name appears only on your reports. All other clients and buildings in the system remain anonymous. You can also input a code for your organization and building names, if you prefer. The “administrator” for your organization will be able to grant either view-only or editing permissions to users on a building-by-building basis. &plus; I have several buildings and would like them organized by my company’s hierarchy. Is this possible? Yes. FM BENCHMARKING supports multiple levels of hierarchy so you can track your buildings by region, state, and city, etc. &plus; Does FM BENCHMARKING track or monitor green initiatives? Yes, we track LEED and ENERGY STAR ratings; we also incorporate carbon footprint information so you can see how your building compares to similar ones and identify which best practices contribute to their results. 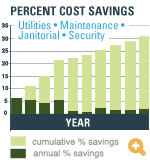 In addition, many of our best practices relate to green initiatives. &plus; I need to develop key performance indicators (KPIs) and show how we are doing from year to year. Can FM BENCHMARKING do that? Yes. FM BENCHMARKING is an ideal way to work with KPIs. Our Premium Edition stores 5 years of data so you can easily track and trend your performance improvements. As soon as you input data for 2 or more years, you can generate comparative reports. &plus; Does FM BENCHMARKING interface with IWMS, CAFM, and CMMS systems? In response to our customers’ demand, we are developing an API to allow all major systems to interface with FM BENCHMARKING and import your existing data. Each system will be responsible for working with us to build this interface. If you have questions about a specific organization, e-mail us at info@fmbenchmarking.com. &plus; Does it matter if you don’t have many buildings in my country? No. Most benefits of benchmarking are country-independent. For example, climate variables are more important than country variables for benchmarking utility costs and energy consumption; you simply compare your energy costs to others who pay similar utility rates. FM BENCHMARKING offers similar measures for each FM area. So even if our database only has a few buildings in a specific country, it still provides value. As the database grows, its value will increase even more. &plus; Does it matter if you don’t have many buildings of my type? Building type is just one filter. You may want to consider other filters for age, number of floors, climate, and business type, among others. You will benefit from FM BENCHMARKING regardless of whether our database contains many buildings of your type. Check our examples to see how many of the data fields will provide useful information for you. 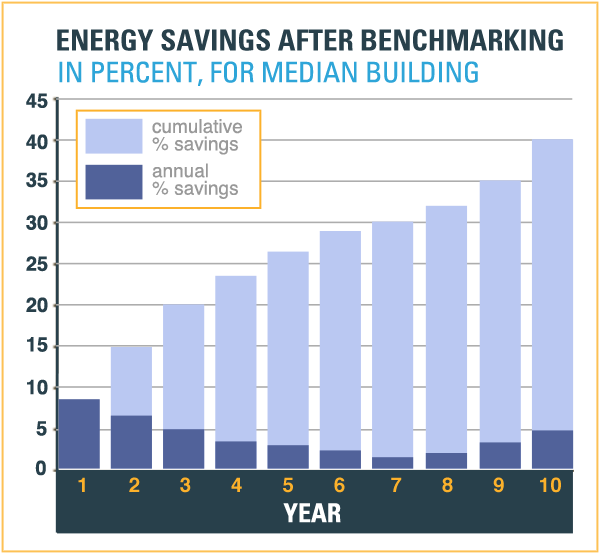 &plus; Does FM BENCHMARKING calculate building area efficiency rates? Yes. The output reports include a chart and table for area utilization per person on gross and rentable basis. &plus; Does the system handle multiple currencies? Yes. Our system already incudes most major currencies, and we are adding more all the time. All benchmarking graphs and reports will reflect the currency select for your data. Exchange rates are updated quarterly.